Spanish Omelette Bento, with recipe! 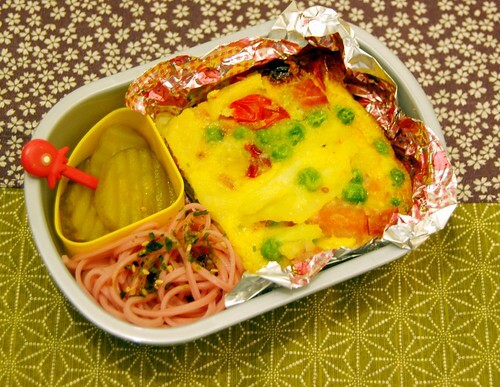 This bento is packed with leftover Spanish omelette from dinner the day before. It’s just as delicious cold the next day, and I love it with dill pickles. Here’s the Spanish Omelette recipe! Peel the potatoes and slice thinly. Wash to remove the starch, then fry vey lightly in olive oil to ensure the potato is slightly sealed and won’t stick. Then remove to a microwave dish, cover and cook until tender. This is the cheat’s method for getting your potatoes completely soft without creating a crispy crust or sticking together and breaking apart. That way, they’ll be soft and melt into the egg when you bite into it. Crack the eggs into a jug, then add the chopped ham, tomatoes and peas. Mix. Add the hot potatoes to the egg, mix around, then return to the pan. Once the bottom is well set, grate some cheddar cheese onto it and pop it in the oven on a low temp until set. Then remove, leave for a few minutes and slice. This will serve two for dinner with a portion left over for a bento, or will make around four large bento portions.